The headline in the Wednesday, January 17, 1962, edition of the Jamestown Post-Journal read "Local Flier's Plane Lost." Jamestown native First Lt. Rodney D. Bloomgren was in command of a jet-powered B-47E strategic bomber, part of the 380th Bombardment Wing out of Plattsburgh Air Force Base, during a training mission early the previous morning. The bomber radioed Plattsburgh, located immediately west of Lake Champlain, at 2am on January 16, and was never heard from again. The training mission was to practice low-altitude bombing runs over Watertown, an oft-used target for Plattsburgh bombers, possibly due to Watertown's close proximity to the Army installation at Fort Drum. Watertown is located between Lake Ontario and the Adirondack wilderness, nearly 150 miles from Plattsburgh. 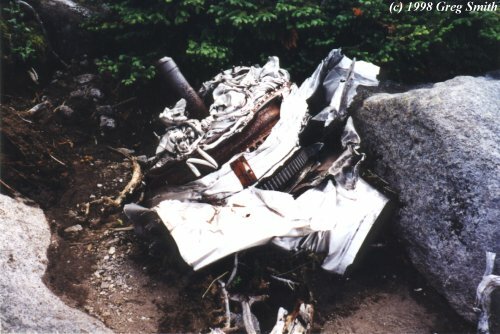 A piece of B-47 wreckage near the summit of Wright Peak. Due to the low-altitude nature of the training run, the crew had been out of radio contact since leaving Watertown. Therefore, when the plane failed to appear in Plattsburgh at 7am when expected, no one had any idea where it was. An enormous search effort was commenced across all of northern New York and other northeastern states, involving not only the US Air Force but the Royal Canadian Air Force as well. Perhaps the plane had overshot Plattsburgh and had crashed into Lake Champlain or Vermont. Perhaps it had continued over Watertown and had gone down in Lake Ontario. Perhaps it just exploded without a trace. No one knew for sure, but everyone seemed to have an answer: hundreds of reports came in from citizens everywhere claiming to have seen and heard explosions at all times during the night. One man reported a huge hole in the ice covering a lake near his home, possibly large enough to accomodate a bomber. Odd tracks in the snow and skid marks on icy lakes were seen. Low-flying planes, barely high enough to clear the trees they were flying over, were seen everywhere. Hundreds of planes must have crashed that night! Each and every lead had to be checked out, and each and every one came up empty. Day after day, the hopes of finding survivors amongst the four crew members waned. Finally, more than four days after the crash occurred, pieces of wreckage were found in the Adirondack High Peaks by a searchplane. Plaque placed by the 380th Bomb Wing near the impact site. had become ill prior to the flight. 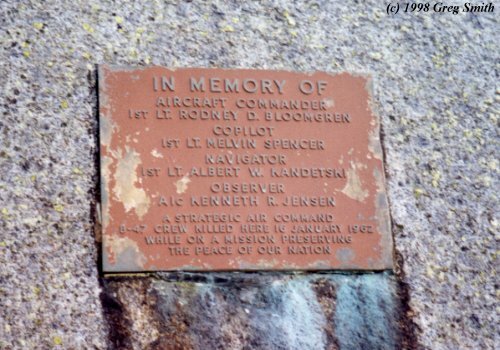 According to the bronze plaque placed at the crash site on Wright, Jensen's function was "observer". He had no official function on the flight; as part of his training he was required to sit in on a certain number of these missions and observe. This was to be his last such required flight. The plane had apparently veered about 30 miles off course on its return trip to Plattsburgh due to inclement weather and high winds, and ventured into the High Peaks. Again, due to a lack of both radio and radar contact with the bomber, it was impossible for the ground crew to know that the plane was off course, let alone warn the pilots. Wright is the 16th tallest mountain in the Adirondacks, at 4580 feet. The bomber was heading in a southwest direction when it just clipped the top of the peak, mere feet from the summit. One might think "if only they were a bit higher..." Unfortunately, had the plane continued on its course, it would have soon come across Mt. Marcy, the tallest mountain in New York State, and nearly one thousand feet taller than Wright. There would have been no escape. As a side note, Plattsburgh AFB was officially closed in 1994 as part of the Air Force's Base Realignment program of 1993, and is now a business and industrial park. Thank you very much to Kristi Davis for her compilation of back issues of the Jamestown, NY Post-Journal regarding her cousin, 1st Lt. Rodney Bloomgren. Go back to main History page.